The 'I Found You' singers performed their biggest hits at the 2012 Jingle Bell Ball at London's O2 Arena. See the pictures of Jay, Max, Nathan, Tom and Siva here. 1. The Wanted open their set with hit single 'I Found You' at The Jingle Bell Ball 2012. 2. The Wanted's Max opens their set with 'I Found You' at the O2 Arena. 3. The Wanted boys sing 'I Found You' to 16,000 fans. 4. The Wanted's Nathan performs for the crowd at Capital's Jingle Bell Ball 2012. 5. Siva and Nathan sing the band's second track of the night, 'Lightning', to a screaming audience. 6. The Wanted's Nathan gestures to the O2 Arena crowd at Capital's Jingle Bell Ball 2012. 7. Each of The Wanted boys entered the stage through a makeshift doorway to begin their set. 8. The Wanted's Siva performs their hit single 'Lightning' at Capital's Jingle Bell Ball 2012. 10. The band also performed their first number one single 'All Time Low' on stage. 11. The crowd watch The Wanted's performance at Capital's Jingle Bell Ball. 12. The Wanted's Max performs a solo during the band's performance of 'All Time Low'. 13. Crowds enjoy the atmosphere at London's O2 Arena. 14. The Wanted, who all opted for white t-shirts except Jay, take a bow at the end of their set. 15. Tom finds himself in the spotlight during their track 'Heart Vacancy'. 16. Nathan takes a pause during the band's track 'Heart Vacancy'. 17. Siva and Jay share an on stage hug at the end of their performance of 'Lightning'. 18. The Wanted's Tom takes a seat to perform the band's slower track, 'Heart Vacancy'. 19. Siva performs 'Chasing The Sun' for the crowd of 16,000 screaming fans. 20. 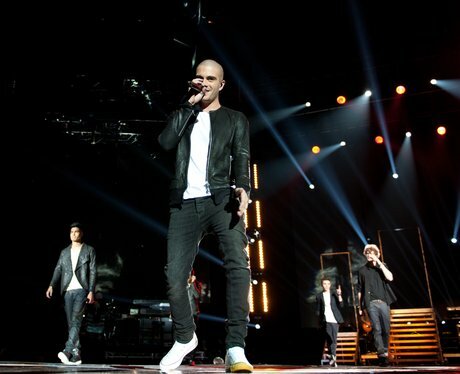 The Wanted dominate the stage at the O2 Arena. 21. Nathan kneels to sing to some lucky fans downstage in the O2 Arena. 22. The Wanted boys each have their own staircase leading down to the stage to begin their set.